The bedroom is often the most private space in a home. It’s a sanctuary away from the hectic hubbub of the home office and a break from the distractions of the living room. And it’s the one room that generally is off limits to visitors and house guests. 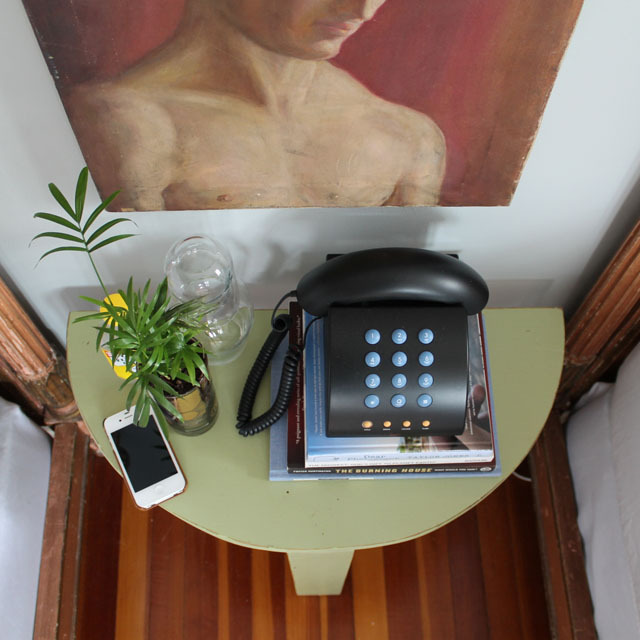 As much as we’ve been told to keep our bedrooms free of electronics and other sleep deprivation devices, the bedside table is still the activity center of the room. Phones, alarm clocks, tablets and other essentials are stashed beside us while we sleep. In collaboration with the folks at Restonic, I thought it would be fun to take a peek inside the inner sanctuaries of others. To kick things off, I’m offering a glimpse of what I keep on my bedside table. iPhone: Not surprisingly, my smartphone is my everything. It’s my alarm clock, white noise machine, music maker and so much more. So of course it sits in a prominent place on the bedside table, ready to be picked up first thing in the morning. Bedtime reading: I have a small stack of books that I turn to when I have trouble falling asleep. I try to keep my bedtime reading light and fun – no zombie apocalypses or political thrillers here! 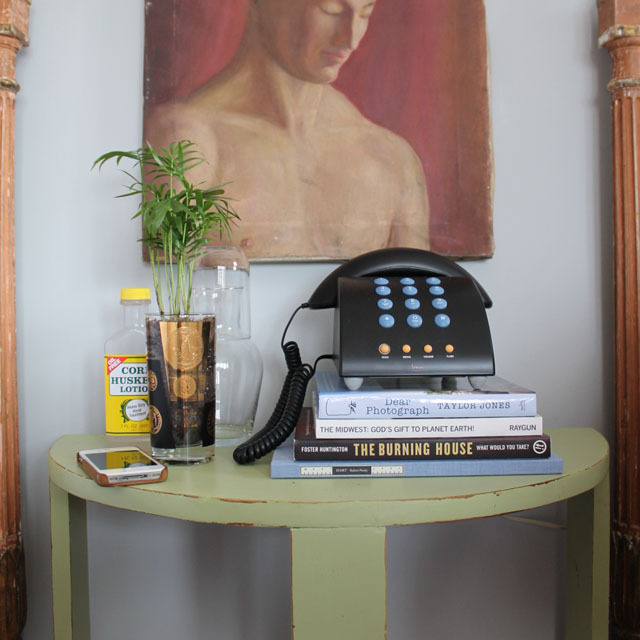 Land line telephone: Although we rarely use the land line, we had to get one in order to have internet at our house. The phone is mostly for show but I have been known to prop up the pillows and have a long conversation just like I did in my teenage years. Water decanter: There’s nothing worse that waking up completely parched and being forced to trek through the cold, dark house for a glass of water. I keep a small water decanter next to the bed for thirst emergencies. House plant: Not only does the plant bring a little life to the bedside, it also helps purify the air I breathe. Lotion: To help combat dry hands, I try to apply lotion right before I turn in for the evening. After I’ve checked my phone for the last time, I’ll apply some Corn Huskers Lotion and let it do its soothing magic while I snooze. Be sure to check out my bedroom tour on the Restonic blog. Interested in showing off your “sleep style?” Email us at mrandmrblandings@gmail.com to show us what you keep on your bedside table or to give us a full bedroom tour. This entry was posted in bedroom, Beside My Bed, decorating, setting up home and tagged bedroom, restonic, sleep style on 04/16/2014 by Jason.